The measurement modules of our partner CSM are extremely rugged, compact, efficient and highly precise over the entire operating temperature range. CSM has been setting technological standards for years now, especially in the field of decentralized measurement technology. Its CAN measurement modules have proven themselves for over 15 years. They are in continual use worldwide and assure easy measurement of temperature, electrical voltages, mechanical stresses, rotational speeds, etc. Measurement applications that require higher bandwidths need a fast communication stream with data throughputs which are higher than the CAN bus can provide. Here CSM utilizes Ethernet in conjunction with the EtherCAT and XCP-on-Ethernet protocols. EtherCAT is an established protocol for fast and synchronous measurement from test bench measuring instruments. XCP-on-Ethernet is a standard protocol for on-board ECU technology in the automotive field. The EtherCAT MiniModules from CSM make use of this protocol to enable synchronized high-speed measurements with measurement data rates of up to 1 MHz per channel. Decentralized measurements in vehicle trials or at the test bench place high demands on measuring instruments. Modules are required to be compact, rugged, reliable and easy to use. Thanks to their minimal package size and IP65/67 level of protection, CSM CAN MiniModules can be mounted directly in a vehicle's engine compartment close to the measuring points with no fear of the harsh environment having an impact on the data measured. Measuring high-voltage components with proven safety in vehicle trials and on the test bench. CSM high-voltage measurement systems were specially developed for safe, precise acquisition of temperatures and analog signals in HV environments, especially in electric and hybrid vehicles. Measurement systems from CSM enable safe HV measurement from the sensor to data acquisition. They can be installed quickly and assure precise and reliable measurement results over the entire operating temperature range. For safe measurement using standard sensors and sensor electrical supplies in HV environments. For safe measurement of HV voltages up to ±90 V.
For safe temperature measurements with thermocouples on high-voltage components. For highly precise temperature measurements with PT100 and PT1000 resistance temperature devices (RTD) in the HV environment. 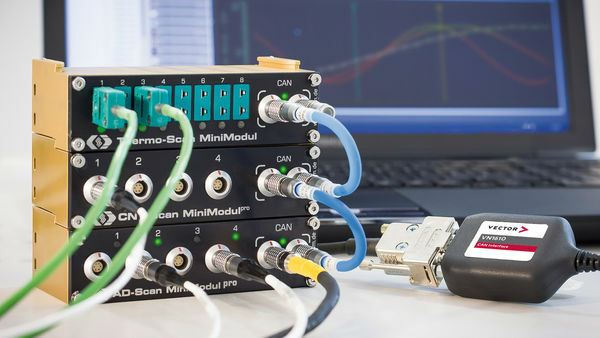 EtherCAT-based MiniModules from CSM are the optimal solution for measurement applications whose requirements exceed the capabilities of the CAN bus. EtherCAT is an established protocol for fast and synchronous measurement from test bench instruments. It sets standards for bandwidth, maximum number of channels and synchronism of measurement signals. As an Ethernet-based data bus, EtherCAT, offers short cycle times and low jitter. In addition, its distributed clock functionality ensures precise synchronization (≤ 1 μs) of all connected modules, regardless of the size of the measurement setup. The XCP-Gateway is the interface between the data acquisition software, e.g. vMeasure CSM/exp, CANape or other 3rd party tools – and the EtherCAT measurement modules from CSM. It contains an EtherCAT master and an XCP-on-Ethernet slave. LambdaCANc is a compact CAN measurement module for connecting numerous Bosch and NTK wideband lambda probes for acquiring lambda and O2 values. This enables them to determine the ideal fuel mixing ratio and optimize air flow and engine efficiency. Shunt-based current measurement under harsh environmental conditions: CSMshunt current sensors extend the application range of CAN-based and EtherCAT-based AD MiniModules from CSM. When connected to AD MiniModules, CSMshunts enable precise and reliable acquisition of current values in the electrical system. The CSMshunts are looped directly into the current path to be measured. When supplemented by voltage taps they enable combined measurement of current and voltage with the AD MiniModules. Hall effect based measurement of highly dynamic currents under challenging environmental conditions: The LEM sensor package has been optimized for use with ECAT AD4 OG modules. A broad assortment of accessories is available to you for CSM measurement modules and data loggers, e.g. system cables, signal cables, connectors, sockets, fasteners, antennas and memory cards. Fast, precise and flexible measurements in the vehicle development sector: CSM Computer-Systeme-Messtechnik GmbH is a leading producer of mobile measurement equipment and data acquisition systems. For over 30 years the company has been setting technological standards in the field of measurement technology. CAN-based and EtherCAT based measurement modules and data loggers from CSM have proven themselves over many years in the development and testing of new vehicles and components. They are particularly suitable for use under extremely harsh operating conditions. The HV measurement systems enable safe measurement of HV components in electric and hybrid vehicles. This product line-up is complemented by a wide selection of memory card drives and memory media for industrial applications as well as programming tools for the development and production of control units.